In 2017, after four years of watching him in a Barcelona shirt, we have been treated to Neymar new look. Still in blue and red, but this time with an addition of white, the Brazilian superstar signed a contract with a top Ligue 1 team and donned the jersey of the French football giants – Paris Saint-Germain. His move to the new club was completed on the 3rd of August for a reported 222 million dollars, which the Paris team paid to the player’s former club. 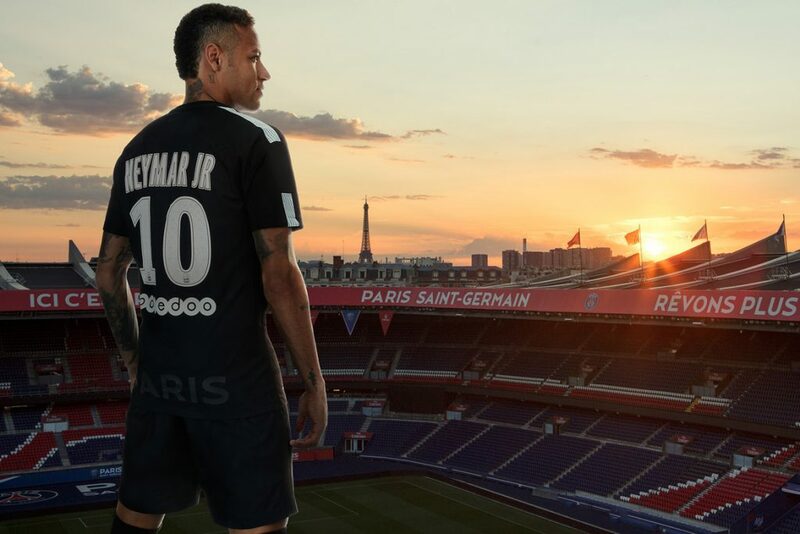 No longer in the shadow of other greats, Neymar is now destined to lead a team of his own and as such his new uniform symbolizes his emergence into his football maturity and a chance at becoming a legend. His destiny as one of football’s greats is now firmly in his hands. Below is our overview of this new personalized apparel and a look at Neymar’s new historic identity. As an official kit of PSG, Neymar’s shirt is made by Nike and uses its proprietary microfiber technology. The home jersey is dark blue with red sleeves. The iconic PSG red stripe runs from the front of the neck down to the seam at the very bottom of the shirt. In contrast to the previous years the stripe is thinner, no longer accompanied by white borders and consists of little chevrons stacked up upon each other. The Nike swoosh on the right breast and the large “Fly Emirates” logo are white, rounding off the three colour aspect of the Paris club’s identity that draws inspiration from the French flag and from the city of Paris. The shirt is combined with dark blue shorts and socks which bear logos of the club and the manufacturer. The collar of the home jersey has a design of its own. It bears the red, blue and white of the French flag as well as the word “Paris” on its back. Inside the shirt, just underneath the collar is the sentence ‘ICI C’EST PARIS”, complete with the Nike swoosh that makes the shirt authentic. Finally, the PSG crest on the left side of the chest is embroidered and pressed on. It consists of the now famous red Eiffel Tower on a blue background, surrounded by concentric white circles. In contrast to the first kit, the away jersey that Neymar wears is all yellow. Its colour was chosen by PSG before the signing of the player, but formed a delicious coincidence with his arrival. For years prior to 2017 – the year Neymar joined the club – Paris Saint-Germain cultivated a successful strategy of signing top Brazilian players. The likes of Ronaldinho, Maxwell, Thiago Silva, Marquinhos, Rai and Lucas Moura have played at PSG over the years and Dani Alves was signed that same summer. To celebrate their habit, the club changed its away colours to yellow in 2017, drawing inspiration from the tops worn by Seleção – the Brazilian national team. It was therefore very fitting to see Neymar himself join the club and the yellow jersey was waiting for him upon arrival. For those rare instances when PSG dons their third kit, Neymar wears the all black jersey of the club. With the exception of the white writing and shoulder stripes, this version appears monochromatic at a distance but reveals a dark camouflage pattern when examined up close. It also bears a large watermark of the word “PARIS” at the bottom rear of the shirt. The writing is all white with a metallic tinge upon close inspection, especially on the team’s crest. In contrasts to the home and away shirt, the collar is all black. 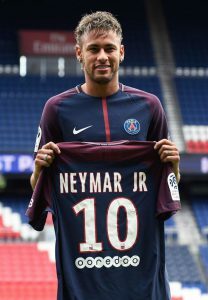 Neymar Jr wears the number 10 at Paris Saint-Germain, which is the same number he wears for the Brazil national team. Prior to his arrival (he wore no 11 at Barcelona), the number 10 belonged to Javier Pastore who offered it as a symbolic welcome gift to his new teammate. On Neymar’s home jersey, the number is white and outlined in red, while on his away one it’s dark teal with a yellow polka dot pattern. The third jersey features the number all in white with a geometric watermark that resembles the beam of the Eiffel Tower. 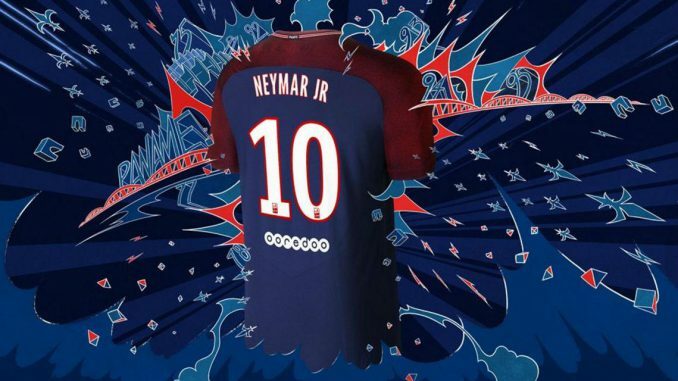 Underneath the number – on each shirt – figures the logo of the Doha based telecommunications sponsor of PSG – Ooredoo. The most important aspects of Neymar’s PSG jersey however, are the technologies used in its creation. Like all official Nike football apparel, it is made entirely of polyester that was obtained from recycled materials. Reclaimed, melted plastic bottles go into the creation of each official Nike PSG shirt and this one is no exception. This process which saves raw materials and reduces energy consumption by an estimated 30% compared to manufacturing virgin polyester has been the cornerstone of Nike’s sustainable innovation drive in the last decade. In addition to this special microfiber, the shirt also features the AeroSwift and Dri-FIT technology. It is shaped in the “superhero” look that clings to Neymar’s body accentuating his physique, while being surprisingly light and flexible. Neymar’s shirt is made with Nike’s AeroSwift technology, which uses a new texturized yarn that is 10% lighter than regular yarn and which stretches 50% better than comparative textures. It feels great against the skin and helps with comfort and mobility. Learn more about the Nike AeroSwift technology here. The other innovation that official Nike football shirts are known for are the Dri-FIT technology, and Neymar’s jersey is no exception. Here, the fiber used in the construction of the garment channels sweat away from the skin to the surface of the shirt, where it evaporates quicker. This seemingly insignificant factor plays a huge difference in how dry the athlete feels during PSG games and how quickly he can cool off. Single, versus double knit in strategic locations allows for better breathability, as do the micro ventilation holes throughout the fabric. Here is the Dri-FIT technology explained. Neymar is one of the most popular players in the world and it’s no surprise that his kit is one of the best selling items in football. Fans should be aware that there are many unofficial copies made, many of which look surprisingly similar to the real thing but are usually of inferior quality. The most common difference is the lack of “ooredoo” writing on the back of the shirt. Those fans who wish to get closer to Neymar’s original experience, however, should know that Nike offers only two official versions of the jersey. The first one is the Nike Vapor Match shirt, which is the exact copy of the jersey that Neymar himself wears during PSG games. It features all the above design elements and innovations. The second official shirt is the Nike Vapor Stadium shirt, often referred to as the “replica jersey”. This version is made of the same material as the previous one and it features all the technologies except Dri-FIT. It is also a bit looser fitting, which makes it the popular choice of the fans, who come in all shapes in sizes. For those interested in an official Neymar shirt of their own, check out his current one here. 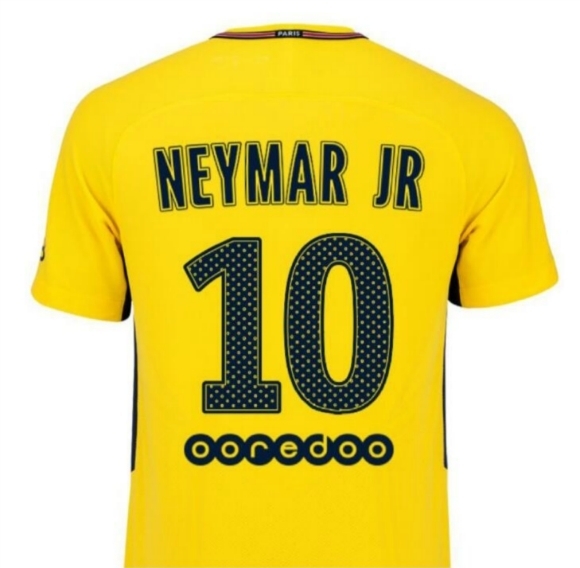 For other Neymar shirts and merchandise, including kid sizes, Brazil kit or even personally signed memorabilia and collectibles this page offers an excellent selection. How do you rate one of the world’s currently best players? How do you view Neymar new look? Is League 1 the right place for him and can he surpass the likes of Messi and Christiano Ronaldo in Paris, given enough time? Leave a comment below and let us know. This is very interesting, I had no idea that melted plastic bottled go into the creation of the jersey. I am wondering how do they make a piece of clothing with plastic and what is the purpose of that? I am not entirely sure how the process works, but I also find it intriguing. Plastic is widely considered to be the least bio-degradable substance out there, so re purposing it is a very good idea. Here is the link to Nike Innovations page from last year: https://news.nike.com/news/innovation-2016 – As to the purpose, I believe the idea is to take a human bi-product and use it in place of consuming new resources. Recycling at its finest! I like Neymar’s away shirt! I love yellow so that’s the one I gravitate towards. I hadn’t even heard of him before I came across this post, so I enjoyed the video you included at the end. Good stuff! Thanks. His away shirt is quickly proving to be quite a hit, given his Brazilian nationality. The current focus is most definitely on the teams that play in the Champions League, but we plan to do articles about the World Cup teams soon as well. Thanks for the kind words! These are some great shirts. I especially love the yellow away jersey! I’ve never been a big soccer fan, but I’ve always liked their uniforms. These are really cool and worth a look for workout wear. I’ve heard of the Dri-FIT before, but I haven’t actually tried anything made using it. I’d be very interested to see how effective it is, particularly since the fabric is made from repurposed plastic. I imagine these feel as amazing as they look! They are quite comfortable to wear, yes. Nike makes a whole array of Dri-FIT products for pretty much every sport out there. On a hot day, they DO make a difference.